The European labor market is characterized by a great economical and institutional divergence. On the one hand, there is the German miracle constituted in part by a decrease in unemployment rate during the Great Recession. On the other, there is high unemployment in southern European countries. For example, 27% in Spain in comparison with 6% in Germany in 2013. 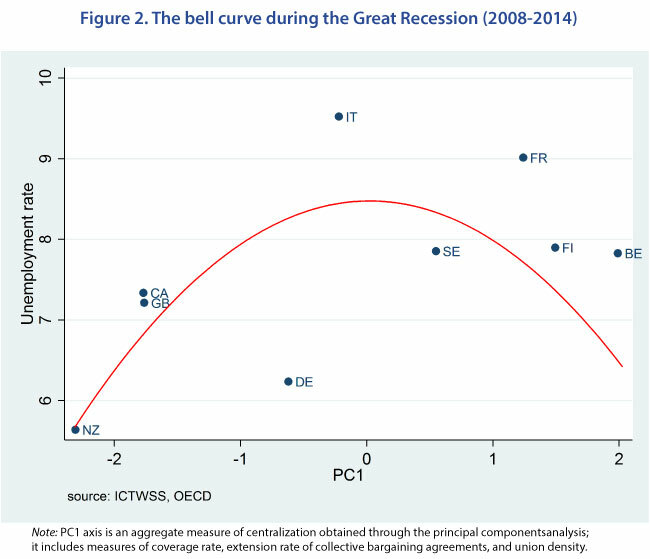 Southern European countries tended to either increase or retain their higher measures of centralization, especially in wage bargaining practices. Therefore, some credit decentralization policies, such as the Hartz reforms, for Germany’s success. However, this economic divergence cannot be explained solely by opposing centralization and decentralization, accentuating the benefits of flexibility in the latter and the drawbacks of rigidity in the former. The most evident counterexamples to this dichotomy are the Scandinavian countries that experience low unemployment with high centralization. It is important to note that in our analysis we focus on centralization in wage bargaining. Our centralization measure relies on union density rate, coverage rate (percentage of all employees covered by collective bargaining agreements out of all wage and salary earners in employment with the right to bargaining), and extension rate (mandatory extension of collective agreements to non-organized employers). Utilizing our definition of centralization consisting out of the three variables of measurement, we identified three profiles of the labor market: decentralized, centralized, and intermediate. As seen in Figure 1, the first group consists of mostly Anglo-Saxon countries, the second mostly of Scandinavian ones, and the third mostly of the four western European countries with the highest GDP in the EU (France, Germany, Spain, and Italy). Calmfors and Driffill (1988) presented their hypothesis of a concave non-monotonic relationship between wage bargaining centralization and macroeconomic performance. The “hump-shaped” relationship hypothesized by the two authors proves itself true with our results and sheds light on the different economic and institutional trajectories of European countries. 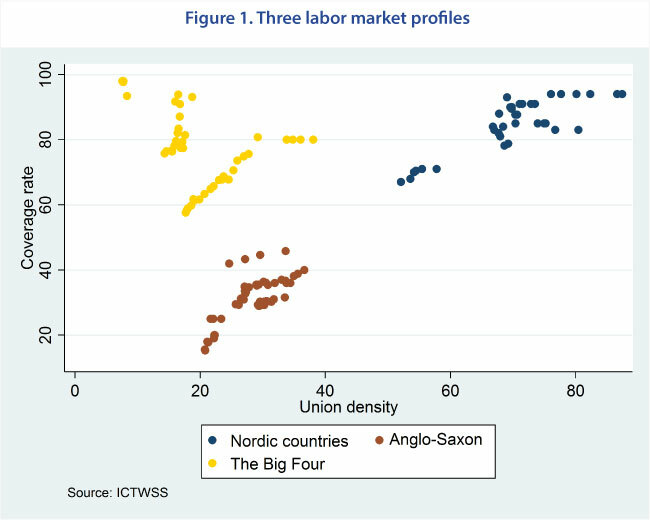 On the left side of the curve of Figure 2, one finds Anglo-Saxon countries with low un- employment rates, due to flexible real wage adjustments in financial shocks. On the right side of the curve, one finds Scandinavian countries with similar macroeconomic performance as that of the Anglo-Saxon countries but this group has very centralized wage setting practices for both employees and employers implemented at the national level. Between the two groups, the intermediate countries find themselves at the top of the hump with higher unemployment rates in comparison to the initial two groups. Consequently, the countries in the middle that aimed to strike a balance have become subject to the disadvantages of both centralized and decentralized systems: wage rigidity that restricts flexibility and adaptability needed in financial shocks, and security provided by collective or national wage setting practices. Our results render the Calmfors-Driffill hypothesis evermore pertinent in the context of the Great Recession. The two most striking countries as outliers on Figure 3 are Germany (DE) and Italy (IT). 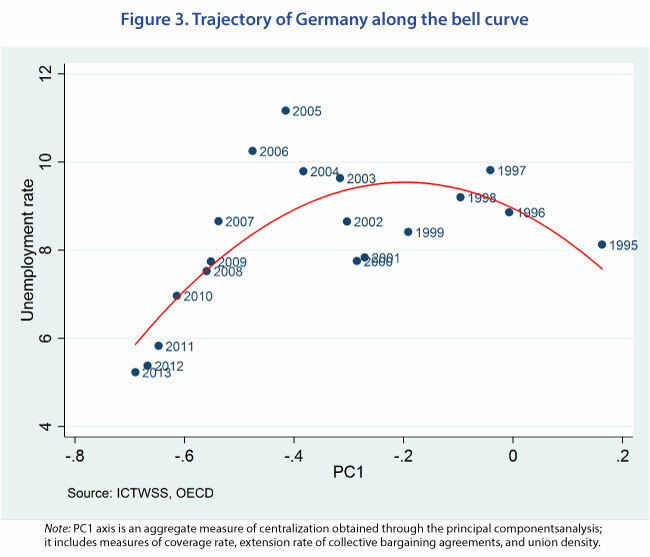 From the 1990’s Germany’s trajectory has been very unique as one can trace its movement along the curve over the years (Figure 3). Germany has left its group of the “Big Four” and moved along the curve toward the decentralized Anglo-Saxon group. This shift is due to the decentralization policies implemented after Reunification and reinforced by the Hartz laws (2003-2005). The country has experienced de-unionization and a sharp decline in union density over the last 20 years. Italy, on the other hand, has maintained high unemployment rates throughout the sampled period and is characterized by less ambitious decentralization. The data supports the notion of a non-monotonic concave relationship between centralization and macroeconomic performance. Institutions constitute an important component of countries’ macroeconomic performances. Considering the idiosyncrasies of every country, it is impossible to prescribe any one centralized or decentralized policy, but our analysis shows that there are multiple different versions of economies that can be tailored to the differing characteristics of European countries and that could yield in the long-term favorable macroeconomic results. Thomas Pastore and Aizhan Shorman. “Calmfors and Driffill Revisited: Analysis of European Institutional and Macroeconomic Heterogeneity”. In: Sciences-Po OFCE Working Paper (October 2018). ← Italy’s debt: Is the bark worse than the bite?